About two months ago, I made a quick simple project for the sake of comforting a friend who unexpectedly, lost her twenty-seven year old son. Usually, when such tragedies strike, most often we may feel helpless not knowing what to say or do. Also, in the beginning of such tragic situations, everyone rallies around to support or help where possible. But as a person who's had my measure of loss, I know that after the dust settles everyone goes back to their routine leaving the one with the loss alone with their own thoughts and sorrows. And let me tell you, it's during those moments that you wish someone would call or stop by. Being cognizant of that, that's when I normally take the time to send a card, write a letter, bring flowers or in this case, I decided to give something that I thought would continually bring comfort by tailoring an encouraging poem suited to my dear friend's needs. After typing out the poem. 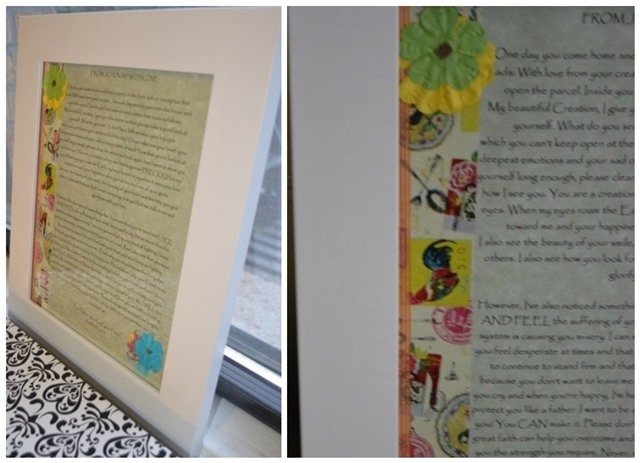 I printed it on high quality sage colored parchment paper, embellished the sides of the poem with orange striped and old world stamp tapes, then layered a few florets in yellow, blue and green...all of her favorite colors. 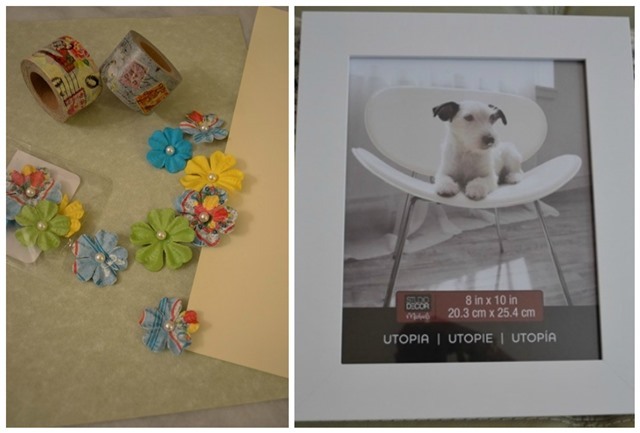 I chose a white frame so the words and the colorful decorations could pop out cheerfully. Once I was all done with the frame, I thought of course, I'd present it as a gift all wrapped in bright silver paper - finished with a sparkly gold bow and orange ribbons affixed on top. I mean c'mon, what girl doesn't like shiny sparkly things?! All this was done with the aim to make her smile and bring joy to her heart perhaps during her lowest silent moments. Never underestimate the value of such a simple, yet thoughtful gift like this. Its advantage? It can be propped on a desk or hung on a wall and could be read over and over again for encouragement, thus bringing a smile and comfort to someone. Knowing that my little effort can do that for someone else, brings me so much pleasure that is indescribable. However, lets not forget that people need comfort all the time. Grieving is not limited to people who have lost someone in death. Life has its ups and downs. Even the people we might think are okay...making us believe that they're okay, might not be most of the time. They might need strength from comforting words just to deal with a stressful job, a challenging marriage, economic pressure, depression, a divorce that might be lingering in the heart and mind, someone who can't have a child, health crisis...I mean, the list can go on and on. Are we aware of what's happening in the lives of our dear ones, or even a neighbor? Why not surprise someone with a thoughtful card "just because" to let them know they're thought of. Imagine if everyone did that for someone else on a regular basis - how many lives would we save from committing suicide? Sometimes, it's the ones that we think are doing superb that could be superficially happy while battling some deep inner problems. I figured I'd share this with you because I had promised here that I would, but most importantly, I'm hoping that it will at least inspire you to do the same for someone in your life. Maybe you happen to be in a situation right now, wanting to help and not knowing exactly what to do...well, this is definitely an idea that will go a long way.